Tomatoes are one of the most versatile produce items in the kitchen. With all its uses, did you know that they’re also rich in Vitamin C and antioxidants? 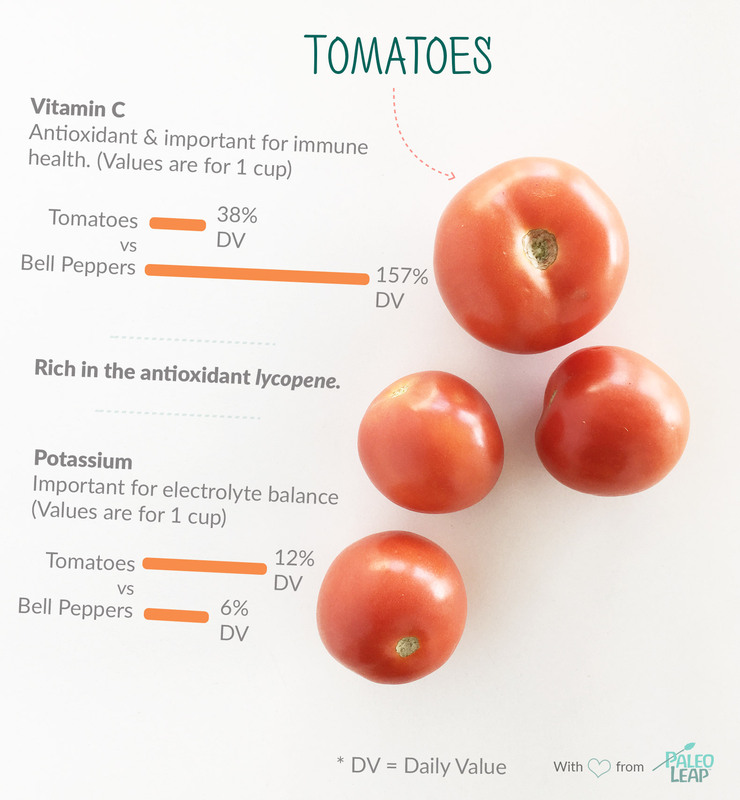 Technically a fruit, but often lumped into the vegetable category, tomatoes are vibrant and full of nutrients and antioxidants. Tomatoes are a source of an antioxidant called lycopene, which can help reduce free radicals and oxidative stress to the body. Tomatoes are a member of the nightshade family, which can prove troublesome for those with an autoimmune condition, or suffer from joint pain or arthritis. Tomatoes are best planted in the spring or early summer, then harvested in mid-late summer. When you see tomatoes overflowing at farmer’s markets in the summer, look for a tomato with tight, smooth skin and that gives a little when squeezed. Orange dots show how 1 cup of tomatoes fits into the typical nutrient profile of a Paleo meal. Purchase vibrant, colorful tomatoes with smooth skin and a slight amount of give when squeezed. Do a sniff test: ripe tomatoes should have a sweet smell. SIZE: Tomatoes range in size from large beef steak to small cherry tomatoes. COLOR: While tomatoes are usually red in color, they can also be yellow, pink, purple, green, or even black. DRIED: Tomatoes can be dried and stored in a cool, dark place in an airtight container. They can be submerged in olive oil, or not. Chop tomatoes, onions and cilantro with herbs to make a salsa. Low simmer tomatoes to make a homemade tomato sauce to pour over zucchini noodles and meatballs. Puree tomatoes, cucumbers, bell peppers and herbs to make a cold gazpacho soup. Make a hearty breakfast by adding sliced tomatoes into a frittata or shakshuka recipe.